(Newser) – Ukraine's embattled prime minister announced Sunday that he is resigning, opening the way for the formation of a new government to end a drawn-out political crisis. 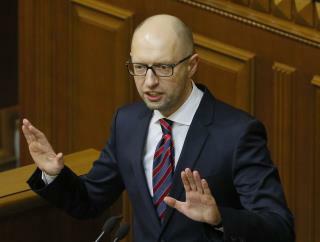 In his weekly televised address, Arseniy Yatsenyuk said his resignation would be formally submitted to parliament on Tuesday, reports the AP. Yatsenyuk's Cabinet survived a no-confidence vote in February, but two parties left the governing coalition to protest the failure to oust the prime minister, who is under fire over the worsening economy and slow pace of reforms. That scumbag need to be hanging from a tree. His first question: 'So, which haven is all my embezzled money in? Because Im about to empty a few more vaults and wanna make sure its gonna be in a safe place when I move to Monaco.